In a move to help boost tourism, officials in Egypt on Saturday opened the ancient tomb of Mehu to the public for the very first time since it was discovered in 1940 by archaeologist Zaki Saad. The tomb, which is estimated to be some 4,300 years old, is located in the Saqqara necropolis near Giza. It belongs to Mehu, a Pharaonic official who was a relative of the first king of the Sixth Dynasty, Jordanian news site Al Bawaba reported. The six burial chambers feature various hieroglyphics depicting Mehu fishing, harvesting and dancing acrobatically. Mehu's 48 titles are also pictured on the walls, along with two crocodiles getting married, according to Global News. "He was an important man," Zahi Hawass, the former Egyptian minister of antiquities, told Saudi station al- Arabiya. "He was a vizier; he was a chief of the judges; he was also the director of the palace." In the wake of the Arab Spring uprising in 2011, Egypt's tourism industry suffered greatly, with tourist arrivals dropping by the millions. According to the United Nations World Tourism Organization, the country went from 14 million tourism travelers in 2010 to 5.3 million in 2016, Global News reported. By the end of 2017, the numbers had increased, with roughly 8.2 million tourists arriving in the country that year. 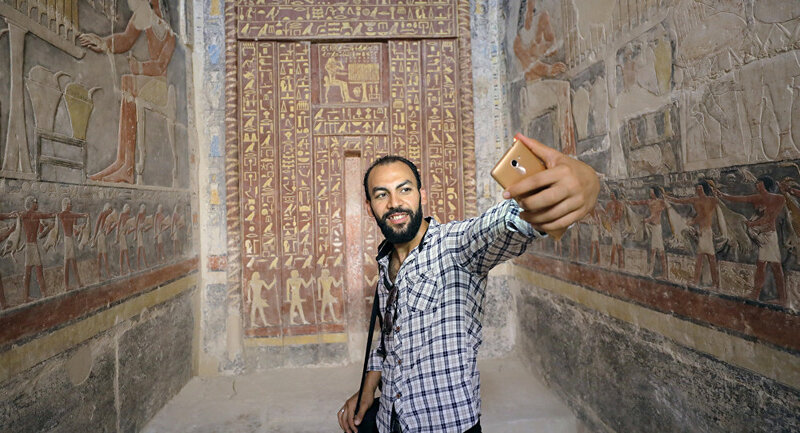 Khaled El Anany, Egypt's current minister of antiquities, told Reuters that officials opted to open the tomb grounds in an effort to "invite ambassadors and show the media that Egypt is safe" in order to grab the attention of travelers. Mehu, a top official under King Pepi I, is buried in the tomb with his son Meren Ra and his grandson Heteb Kha.